Situated in Tukwila, Wash., minutes from downtown Seattle and the Seattle-Tacoma International Airport, Hotel Interurban offers 185 contemporary-style guestrooms. The 19-story hotel is the tallest building in Tukwila, surrounded by more than 200 entertainment, shopping and dining options. The hotel offers an indoor saline pool and over 15,000 square feet of meeting and event spaces, including the 19th-floor Rainier Room with a spectacular view of iconic Mount Rainier. Other features include a lobby espresso bar and the Waterleaf Restaurant & Bar, offering a casual dining option with a focus on globally inspired cuisine. 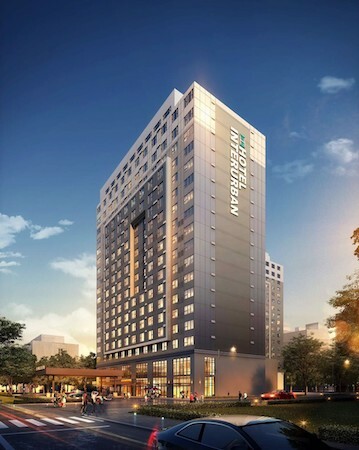 Hotel Interurban is owned by a group of local real estate developers and will be managed by Columbia Hospitality, Inc. For more information, visit www.hotelinterurban.com.